One of the favorite offseason time wasters for fans and media types alike is to project lines for the upcoming season. Where does Paul Stastny fit in? Is Erik Haula a center or a wing? What are the chances of Erik Brannstrom or Zach Whitecloud cracking the lineup out of the camp? They are all legitimate questions, and who am I to stop those debates, but while writing the article on Vadim Shipachyov’s hatred for Vegas I stumbled across a line chart from early in the season last year. It looks quite a bit different from what we saw in the Stanley Cup Final and it might put a bit of pause on some of those line projection discussions. Last year the Golden Knights were a brand new franchise with a collection of players who had never played together. There were no clear-cut lines or pairings to bank on heading into the year. So, obviously, things are a bit different going into 2018-19, but take a look at the line charts from Game 1 and Game 6 of last season. Cody Eakin, top line center. Brayden McNabb, scratched for Brad Hunt, Jon Merrill, and Luca Sbisa. William Karlsson and Erik Haula, interchangeable at wing and center. Oscar Lindberg, relied upon center. Shea Theodore, in the AHL. The point is, things change, and in a hurry. The Golden Knights are almost certainly going to head into 2018-19 with Reilly Smith, Jonathan Marchessault, and William Karlsson as the top line, but beyond that, almost everything is flexible. The roster that broke camp and headed to Dallas included eight players that did not play a second in the Stanley Cup Final. Eight out of 23 is 35% of the roster. 35% of the Golden Knights roster at the start of the year was not there at the end. It wasn’t until Game 8 that the Karlsson line was created. Schmidt wasn’t paired with McNabb until Game 18. The Golden Knights middle six and all three defensive pairings are far from set in stone. However, when we finally get to camp and we finally get to see what’s on the reigning Jack Adams’ Award winner’s mind, remember what you see then probably isn’t what you’ll be seeing when the games really start to count. Great, great, great time for a reality check for Vegas fans. It’s super fun to play arm-chair GM/Coach, but for us it’s a hobby for McPhee and Gallant it is their job. And they win awards for their job. I don’t know a thing about McKenzie though. GMGM did not sign Stastny to a $6.5 Million a year contract, nor did Stastny choose VGK to play on the third line. With the Miller signing, he is now GMGM’s number 1 defenseman, which makes scoring the most important thing. You must consider at the defense positions who is right and left handed. With our top six we only have two right handed players in Miller and Englland. Schmidt is the only one who has proven he can play both sides effectively. As long as the coach is going to play all of the defensive lines equally the order won’t mater at all. Therefore, here is my lineup. A lot of your points are great, but Miller is not the #1 dman. Even with his new contract. That was more timing than anything. Schmidt’s is up after this next season and he will eclipse Miller. As of right now, Schmidt is their number one dman. 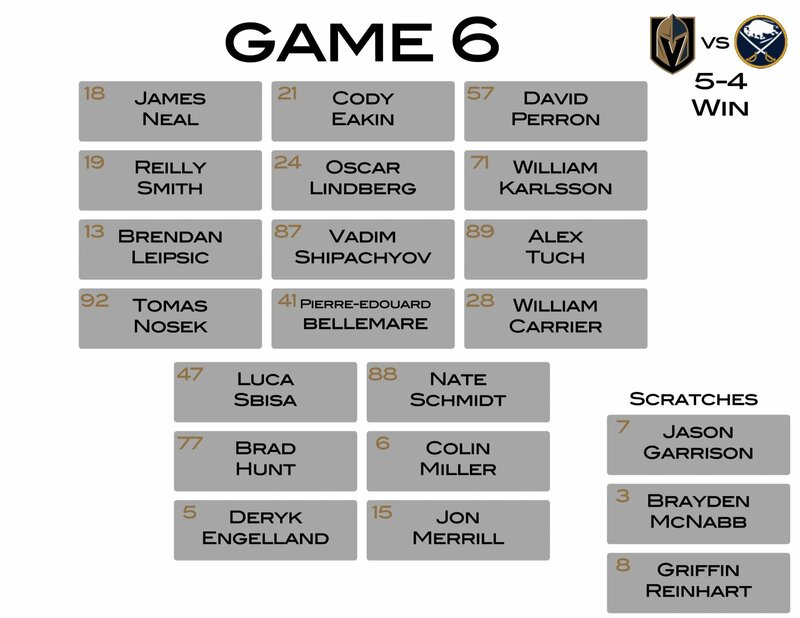 I think teams are going to play VGK a lot harder this year so I’m going with balanced lines. Nosek has to move off the 4th line to grow. I think he could develop into a 2 way power forward. I could see VGK bring Pirri back to the 20 goal scorer he was earlier in his career or Hyka breaking the line up. In todays NHL the 4th line has to be able to score as well as do the things they have always done. I like Carpenter in the line up because he can score goals and he can be a 3rd pairing PK, save Stastny unneeded minutes. Smith and McKenzie were dynamite line mates in college and still good friends. Watch how this plays out to VGKs benefit. McKenzie killed it with Tex Stars. VGKs got an excellent player/leader at a steal of a price. I guess I’m the only one who thinks Karlsson reverts to a 3rd line shut down forward and forces Gallant to move Stasny to the first line as the team struggles all season looking for balanced scoring from the first 2 lines without a true scoring 1st line center. I wouldn’t be surprised to see a move from the minors filling a top 6 role. Yep. Definitely the only one who thinks that.